Heybridge and Maldon on the River Blackwater, Essex, have a long maritime history from defending English shores against invasion from the Danes in the 10th century to providing a safe harbour for working vessels in the 19th and 20th centuries. Today, there’s a lively tourist trade in an area particularly popular with sailors. This extract is taken from a ‘Guide for travellers in Essex’ published in 1818, just over 20 years after the construction of Heybridge Basin. The Chelmer and Blackwater Navigation, a 13-mile canal from the Blackwater Estuary to Chelmsford, was built between 1793 and 1796, to provide a route inland for the growing trade from the north of England to London. 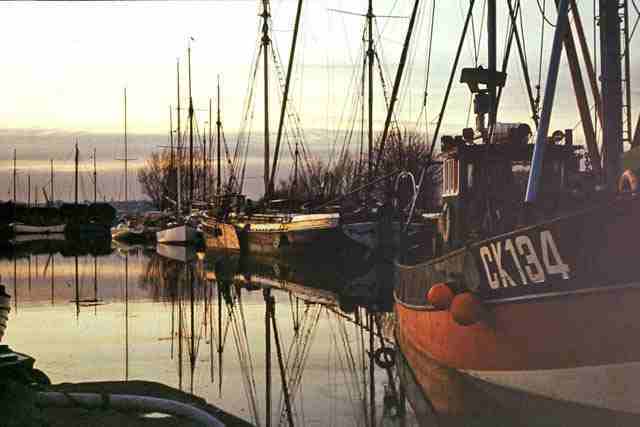 At Heybridge Basin, the sea lock was built large enough to allow brigs and other sailing vessels to enter the Basin. Colliers’ barges unloaded onto horse-drawn ‘Chelmer lighters’, 60 ft long and 16 feet wide, with carvel hull construction similar to the Thames barges. On 23 April 1796 the first brig, aptly named, ‘Fortunes Increase’ sailed into the Basin with a cargo of Sunderland coal for Chelmsford. Heybridge is a village opposite Maldon on the northern side of the Blackwater, and is supposed to have derived its name from an ancient bridge of five arches, beneath which the main stream is said to have formerly run, though now it flows at some distance through Full-bridge. Its original name appears to have been Tidwalditune . . . Heybridge Bridge was erected by Henry the Sixth. Heybridge, in consequence of the Chelmer navigation passing through it, is much improved, and has a great addition of trade, and of houses. Between Heybridge and Maldon is a raised causeway, which was made before the time of Edward the Second, who ordered it to be surveyed in the year 1324. Maldon is an ancient and populous borough and market-town, and the principal of the Dengey Hundred: it is situated on the acclivity of an eminence south-west of the Blackwater. This town has been frequently pointed out as the Rolam Camulodunuim; but upon very slight grounds, as the earliest mention of Maldon by historians is in the year 913, when Edward the Elder encamped here to oppose the incursions of the Danes, whilst a fortification was constructing at Witham. In the year 920, he again encamped at Maldon, and according to Marianus built a castle here; but as no traces of this structure have been found, it seems probable that Marianus alludes to the entrenchment or fort before mentioned, which lies on the west side of the town, and apparently enclosed about twenty-four acres. Being of an oblong figure, three sides of the rampart have lately been traced, the other is defaced by buildings. This place was of considerable strength, as, in 921, a large Danish force besieged it without effect. In 993, it was again attacked by the Danes under Ulaff, when the forces of the Earl Byrhtroth coming to its relief, they were defeated, and the Earl himself slain. In the Domesday survey, Maldon is styled a half hundred ; and had then 180 houses, and a hall, held by the burgesses of the king, who had also a house here. Maldon at present consists of one principal street, running nearly a mile east and west; a cross street of considerable length, and several smaller avenues and back lanes. The descent from the upper part to the river is very steep; and many of the houses built within the last half century are good. The import trade is considerable consisting of coal, iron, deal, corn, &c. At spring tides the river will bring up vessels that draw eight feet water; but the coals are brought to the town in lighters.